Abstract. We report on updated trends using different merged datasets from satellite and ground-based observations for the period from 1979 to 2016. Trends were determined by applying a multiple linear regression (MLR) to annual mean zonal mean data. Merged datasets used here include NASA MOD v8.6 and National Oceanic and Atmospheric Administration (NOAA) merge v8.6, both based on data from the series of Solar Backscatter UltraViolet (SBUV) and SBUV-2 satellite instruments (1978–present) as well as the Global Ozone Monitoring Experiment (GOME)-type Total Ozone (GTO) and GOME-SCIAMACHY-GOME-2 (GSG) merged datasets (1995–present), mainly comprising satellite data from GOME, the Scanning Imaging Absorption Spectrometer for Atmospheric Chartography (SCIAMACHY), and GOME-2A. The fifth dataset consists of the monthly mean zonal mean data from ground-based measurements collected at World Ozone and UV Data Center (WOUDC). The addition of four more years of data since the last World Meteorological Organization (WMO) ozone assessment (2013–2016) shows that for most datasets and regions the trends since the stratospheric halogen reached its maximum (∼1996 globally and ∼ 2000 in polar regions) are mostly not significantly different from zero. However, for some latitudes, in particular the Southern Hemisphere extratropics and Northern Hemisphere subtropics, several datasets show small positive trends of slightly below +1% decade−1 that are barely statistically significant at the 2σ uncertainty level. In the tropics, only two datasets show significant trends of +0.5 to +0.8% decade−1, while the others show near-zero trends. Positive trends since 2000 have been observed over Antarctica in September, but near-zero trends are found in October as well as in March over the Arctic. Uncertainties due to possible drifts between the datasets, from the merging procedure used to combine satellite datasets and related to the low sampling of ground-based data, are not accounted for in the trend analysis. Consequently, the retrieved trends can be only considered to be at the brink of becoming significant, but there are indications that we are about to emerge into the expected recovery phase. 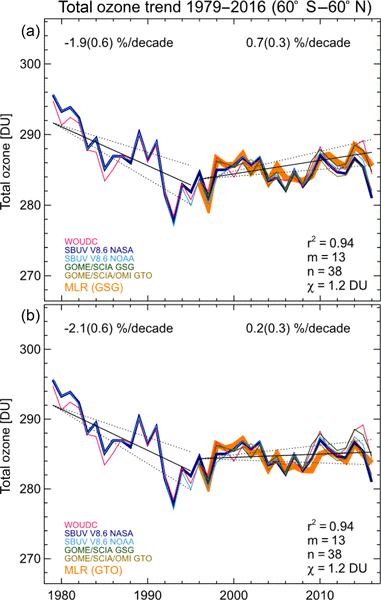 However, the recent trends are still considerably masked by the observed large year-to-year dynamical variability in total ozone. 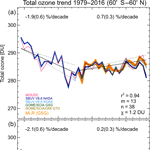 How to cite: Weber, M., Coldewey-Egbers, M., Fioletov, V. E., Frith, S. M., Wild, J. D., Burrows, J. P., Long, C. S., and Loyola, D.: Total ozone trends from 1979 to 2016 derived from five merged observational datasets – the emergence into ozone recovery, Atmos. Chem. Phys., 18, 2097-2117, https://doi.org/10.5194/acp-18-2097-2018, 2018.